Ben Kelly’s Minecraft world’s are, literally, known all over the world. Ben is the creator of the Sustainability Shuffle and dozens of other Minecraft worlds used in Minecraft: Education Edition and is a Global Minecraft Mentor. Looking at some of these creations, it really is amazing how far we’ve come in a few short years. 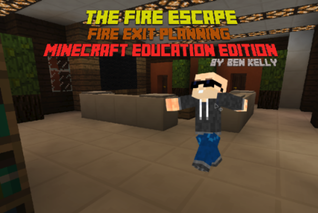 Ben creates downloadable worlds, along with lessons, which teachers anywhere can use to teach everything from social studies to environmental science. Minecraft is a global game. It is still, despite the Fortnite hype train, BY FAR, the most played game on the planet. With that being said, most Minecraft games were being played in single classrooms, or in homes, and not being shared until recently. Ben and his fellow Global Minecraft Mentors have really stepped up and made the amazing educational worlds they are building something that can be used by any teacher using Minecraft in their classroom. Why stop there? Why stop at the teacher down the hall? Why don’t we share this world file, worldwide? The Sustainability Shuffle is the pinnacle of this concept. A travelling Minecraft world, dealing with 17 global environmental issues, making its way to classrooms from Canada to Saudi Arabia and teaching students the importance of caring for the environment. In each scenario, whichever country the project is in, students use their opportunity to leave their own mark on the world for the next group of players to explore. We really do live in a shrinking world, and Ben’s amazing work is teaching students all about it in a truly amazing way.